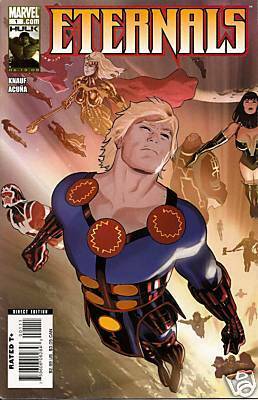 All images and logos ©Marvel Enterntainment, Inc.
…written by Neil Gaiman, art by John Romita Jr. that I also lettered. The logo on that one looks like it was made from a commercial font, and was not by me. Marvel could easily have used it on the new series to provide continuity, but the editors thought they’d like to do something a bit more Kirbyish. 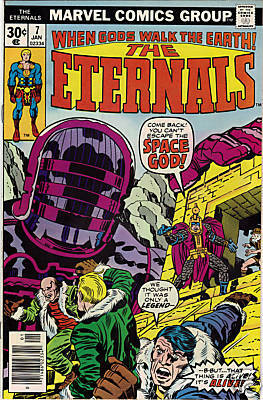 The Eternals were, of course, created by Jack Kirby, and his issues had the logo seen above, which is what I would call a fairly typical 1970s Marvel logo, perhaps designed by someone on staff at the time, possibly Jim Novak. It’s big, bold, and easily readible, if a little old-fashioned looking now, but I took at it as a starting point for my own new design. One thing I DID design for the Gaiman series was this logo for the inside front covers, and I thought it had promise, so I developed it further. Taking as many cues as possible from Kirby, I filled the center of the letters with “Kirby dots”, something the master used to create the impression of energy in his backgrounds. 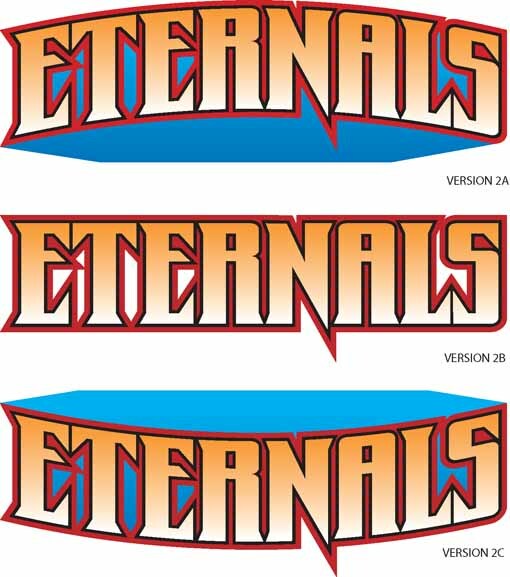 I did a straight version, and two curved ones similar to the original Eternals logo. Next I tried another style, this one with pointed serifs, in the same three formats. I felt this combination of triangular points and broad vertical strokes might work for the book. The red outline fades against this particular artwork, but the letters are still strong and readable, which is the most important thing. Looks pretty good, I think. 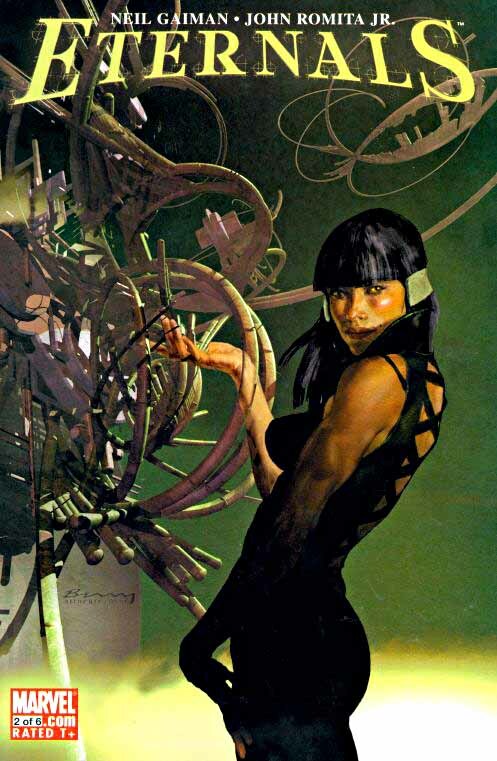 I might add, the painted art on the series is quite attractive, and the stories aren’t bad either. You might want to give it a try. This entry was posted in Logo Studies on June 8, 2008 by Todd. Publishers really go for those pointy serifs, don’t they? I’m very fond of your “version 1” set and it definitely looks the most Kirbyesque — regardless of the Kirby dots. I MUCH prefer the Kirby dots idea. And the arch of 1A, but I think the BLUE area just blocks out artwork (Nice throwback to the original though). I do think however the logo chosen works best with the artwork they have (awesome art!). Was the art done before the logo? Do you think that was a factor? I don’t like version 4… It looks too much like an Asian logo, not that that’s a bad thing, I just feel like I’ve seen a ton of Asian riffs over the last 10 years. Now version 3 is very interesting! Kinda Indian or Bengali influence? I hope you can sell that idea to someone. 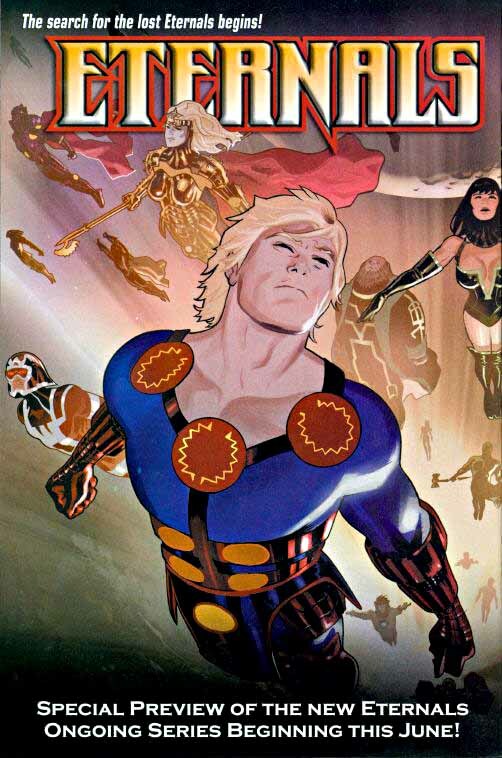 Anyway, I’m eagerly looking forward to Eternals. The artwork may have been a factor in the decision, though I hadn’t seen it when I did the designs.